I present to you today: the blondie. For these particular little guys, think as if shortbread and a peanut butter cookie had a love child. This is pretty much what you’d get. 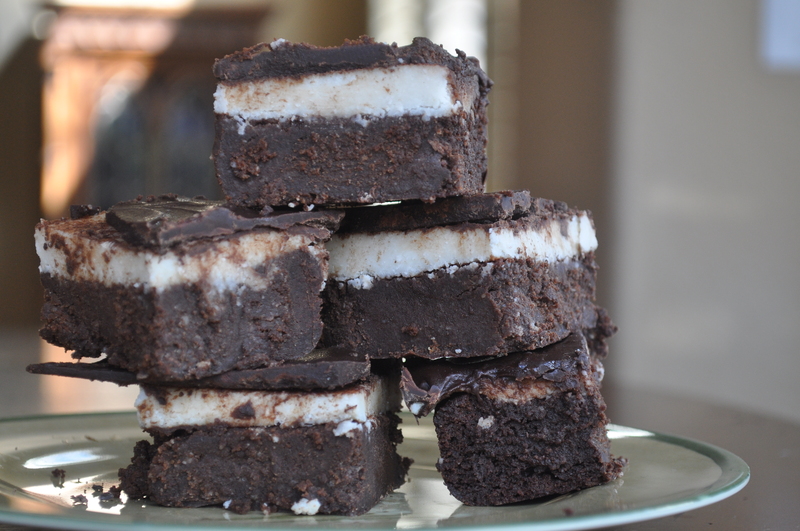 They were delightfully crumbly and addicting and were adored by gluten-eating and GF individuals alike. This recipe is very loosely based off of Food52’s with some changes here and there. The almond extract really brings a rich nuttiness to the cookie and the coconut flour soaks up a lot of the moisture, making these more of a shortbread-y texture than your typical blondie. I recommend these for a crowd. Simple and universally yummy. This recipe was a hit. 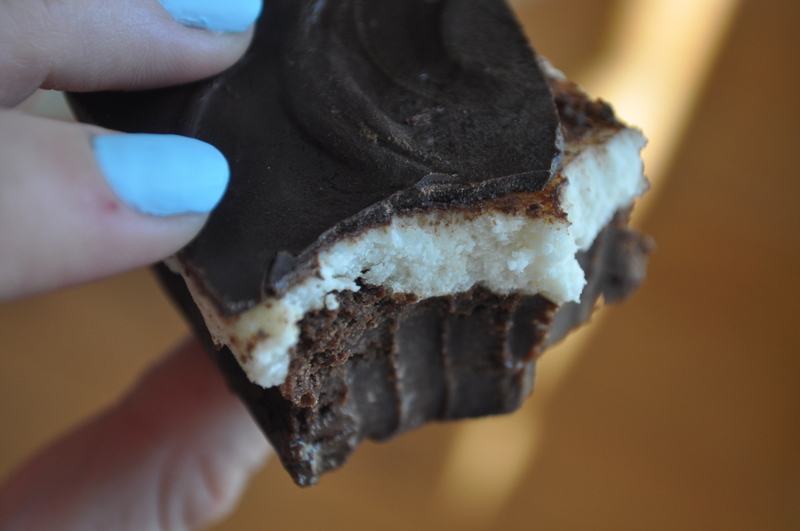 I’d absolutely make these again. In other news…can you believe it’s almost FALL? *Cue excessive canned pumpkin buying/hoarding* I can’t even tell you how excited I am to make soups and stews and curries and everything with more cinnamon in it than should be allowed. You can’t stop me. Yippeeee! 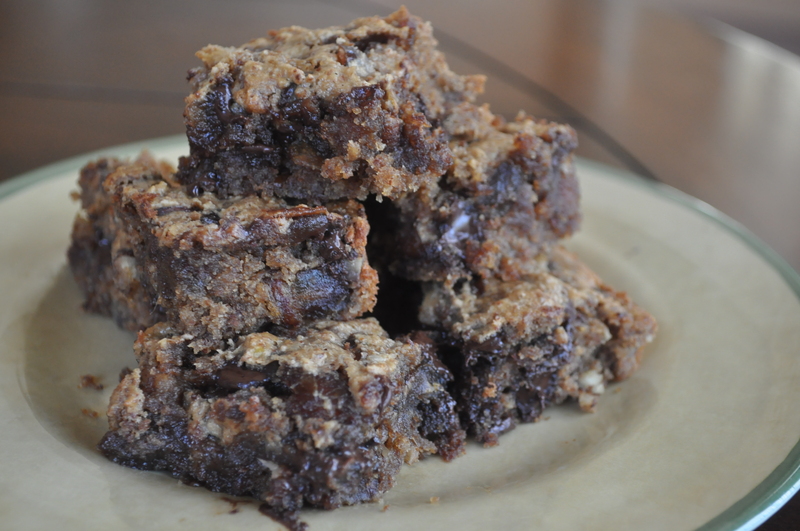 Categories: Dessert | Tags: bars, blondie, blondies, chocolate chip, dark chocolate, dessert, peanut butter | Permalink. It’s FAAAALL. Well. Kinda. Not quite. It’s technically still summer for the next couple of days. But mentally (and according to these cookies), I am 100% in fall-mode. As a California baby, I’m especially enthusiastic about this season. I really just love being cozy, and fall is arguably the coziest season of all (winter crosses the line from cozy to cold, in my personal opinion). I am all for fall baking/cooking, too. It’s by far my favorite. Pumpkin, cinnamon, apples, squash, cinnamon, pumpkin, CINNAMON. You get the picture. These lovely little cookies pretty much incorporate everything I love. 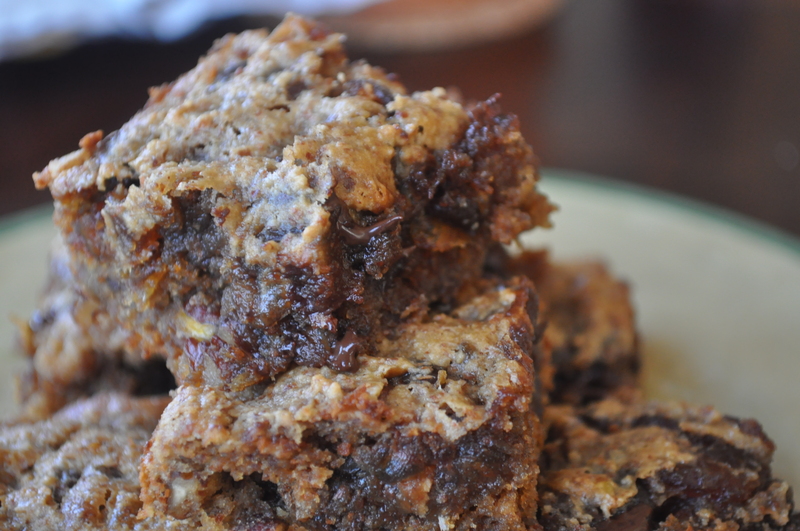 Pumpkin, dark chocolate, and cinnamon, all combined in a delectable, chewy little morsel. Mmmmmm these cookies are yum. I can’t wait to eat one for breakfast-dessert when I get home. And probably another for lunch-dessert later. Start to make the dough by mixing together the sugars and the butter until there aren’t any more lumps. Next, whisk in the vanilla and pumpkin until smooth. In a separate bowl, stir together the flour, baking powder, baking soda, salt, and cinnamon. Pour the wet ingredients into the dry ingredients and mix until just combined. Stir in the chocolate chips as best you can–the butter will probably make it a little hard for the chocolate chips to stick to the dough since it’s so buttery (yum), but do your best. Stick the dough in the fridge for at least 30 minutes before you bake. (Ahem: That’s important! Don’t skip it!) Preheat the oven to 350°. Grease or line your baking sheets and place balls of dough about 1″ apart. (I got about 18 cookies here; you could get more or less depending on how big your cookies are and such.) Squish them a little bit flat–they won’t flatten much at all while baking–and place in the oven for 8-10 minutes. They won’t look done, but they are! By “not done”, I mean extremely doughy. I promise they’ll firm up quite a bit as they cool. 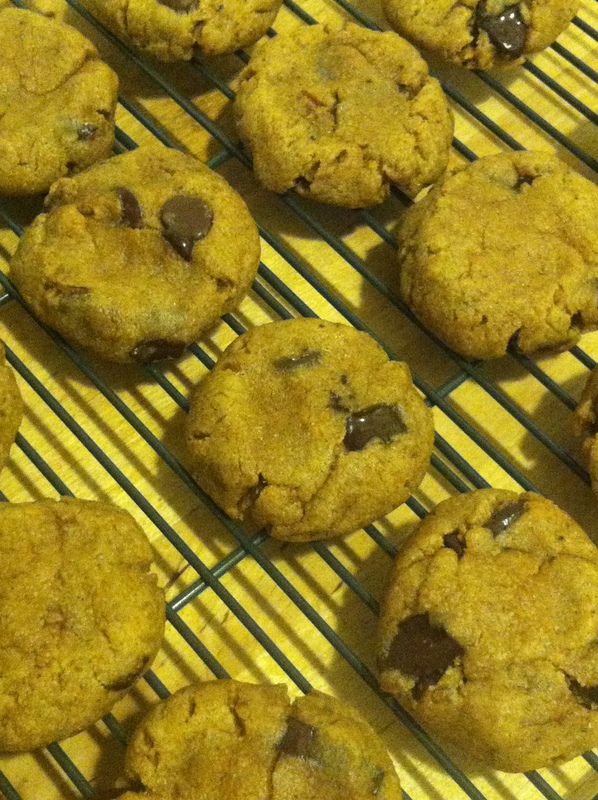 Let them cool for a while on the cookie sheet before transferring them to a cooling rack. I brought these to Boston with me for a little weekend trip and they were certainly appreciated. My two lovely boys and I ate 3 a day until they were gone, so they didn’t last long. Not to toot my own horn (okay, maybe a little…I’m proud of these cookies) buuuut I was told by my toughest critic (and others) that these cookies are his favorite thing I have baked to date. Welllll, okay, his favorite thing that he has tried at least. To be honest, that is probably a pretty good indicator of how delicious they are, seeing as he’s tried probably 60% at least of the food I’ve made. I rarely get compliments from this individual, so this is a big deal, guys. Prepare for more pumpkin. I guarantee you it’s COMING. PS: THIS PHOTO IS SO TERRIBLE I AM SORRY I am honestly so embarrassed. It’s heinous. I don’t have my Nikon and it was nighttime when I took this on my phone. I was in a hurry and ate them all before proper photos could be taken sooo this will have to do I suppose. Don’t judge me. Categories: Dessert | Tags: chocolate, chocolate chip, cookie, dark chocolate, dessert, pumpkin | Permalink. Happy August, lovers and friends! It’s my birthday month (weeeeeeeee but also ahhhh) which is both great and absolutely terrifying. Great because: I have fun planzzz ahead of me, August is generally beautiful in San Diego, I’ll finally be 21 (PARTY YEAHHH but actually totally kidding; all I really want is to be able to order a beer out without fear of being arrested), and just because to be quite honest, who doesn’t love birthdays? Terrifying because: I am rapidly approaching the age when the term “adult” is unavoidable (shhhh I’m still in denial), summer is almost over (?! ), and school/real life commences again in a short couple of weeks. I have exciting things ahead of me though. Exciting and scary, but exciting nonetheless. I guess that’s “adulthood” (shudder). Preheat the oven to the usual 350°. In a large bowl, mix together all the ingredients (yep, that’s it!) and plop heaping spoonfuls onto a lightly greased cookie sheet. I got 16 cookies total–8 per cookie sheet. Flatten each cookie out as much as possible with the back of a spoon until they’re all thin and spread out. Make sure they’re not too close together; they’ll spread even more when baking. Stick ’em in the oven for about 8 minutes or until the edges are lightly browned. If they spread enough to touch one another, don’t worry! Once you pull them out, use a spatula to gently separate them and shape them a little before they set. 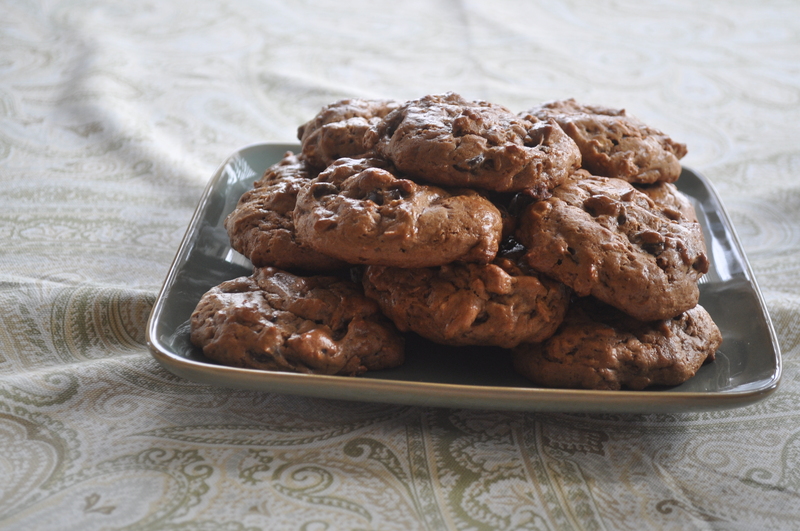 Let them cool completely on the cookie sheet before transferring them to a cooling rack. Do this carefully! They’re fragile little guys! 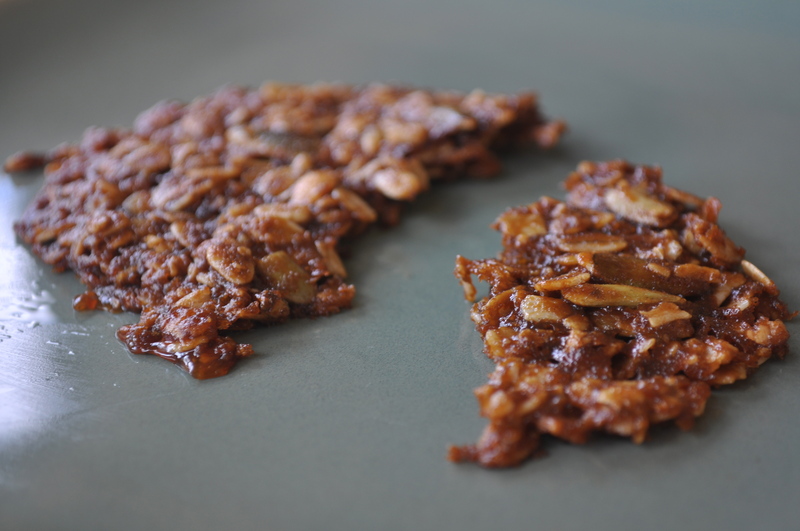 These cookies are so nice and thin and spicy and chewy and oatmeal-y and lovely. A little different from my usual thick, chewy cookie preference, but still good. Change is good, right? My dad is certainly a fan–he’s already eaten 3 of them. What else is new. Happy (almost) weekend, loves! Go get yourself some sunshine. 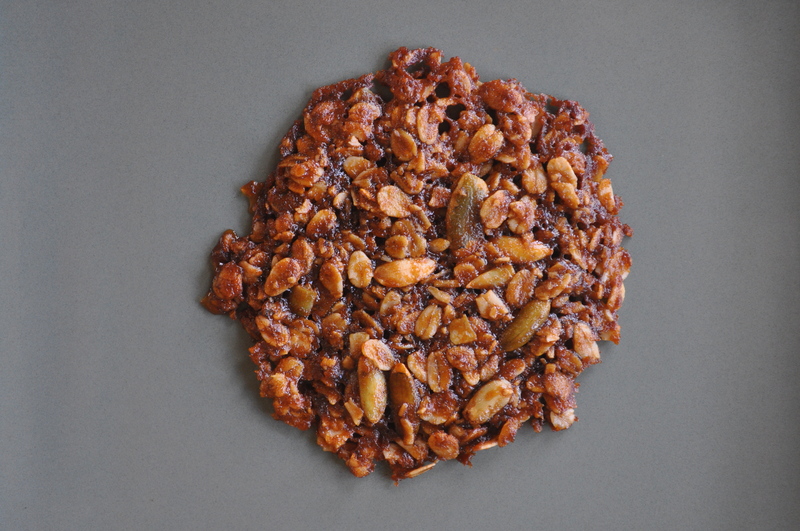 Categories: Dessert | Tags: cookies, dessert, ginger, gluten free, oatmeal, pepita | Permalink. So let’s talk cheesecake. My dad really wanted me to make him a cheesecake for his birthday (8/13) but unfortunately, I was in the process of leaving for NY right around then and didn’t have the time/energy while I was scrambling to get ready to make one. 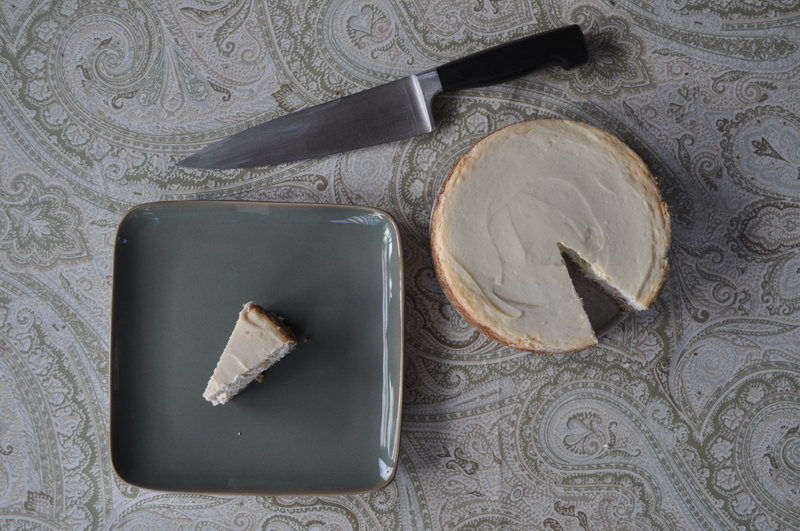 If you’ve ever made a cheesecake, you know how picky and labor intensive they can be. Not so much a last minute, bake-this-on-a-whim kind of dessert. Luckily, I came home a few weeks early (weeee) so my dad’s birthday cheesecake was only a mere 10 days late! 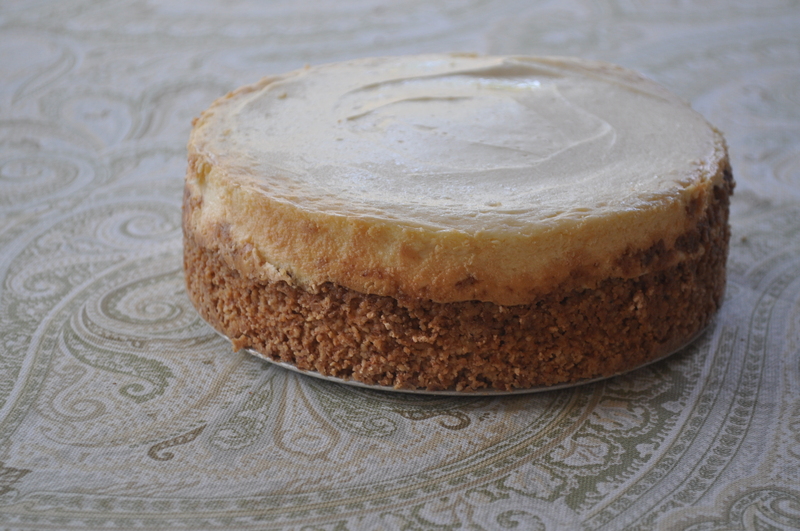 This cheesecake is loosely based off of this lovely recipe. And what a fabulous one it was. Preheat the oven to 350° and begin to prepare your crust. Grease an 8″ or 9″ springform pan and set aside. Pulse the cashews, coconut, and brown sugar together in a food processor until you get a medium-fine crumb. Add the melted coconut oil, stir until combined, and press evenly into your springform pan. Place in the oven for 20 minutes or so until the crust is lightly golden brown. Remove while you prepare the filling. Increase the oven temperature to 400° and move on to preparing the cheesy part of said cheesecake. With an electric mixer (for those of us who don’t have fancy shmancy stand mixers……it’s not like I’m bitter/jealous or anything…..), mix together the cream cheese and sugar until it’s all nice and fluffy. Add your lime juice and zest and mix again. Separate your whites and yolks of your two eggs and drop the yolks into your cream cheese mixture, leaving the whites in a separate bowl for whipping. Mix in the yolks and set this aside while you whip the whites to soft peaks. Once sufficiently whipped, gently fold the egg whites into the rest of the filling with a spatula. Pour the filling into the crust and smooth out the top. Place the cheesecake on the middle rack in the oven and bake at 400° for 10 minutes before you reduce the temperature to 225°, baking like this for at least another hour (or until mostly set but still sliiightly jiggly in the middle). Once done baking, turn off the oven and leave the cheesecake inside with the door closed for at least another hour–this well help it cool gradually so it doesn’t crack. (Because, let’s be honest, what is more devastating than a cheesecake with a cracked top?) After an hour, pull the cheesecake out and place on a cooling rack. 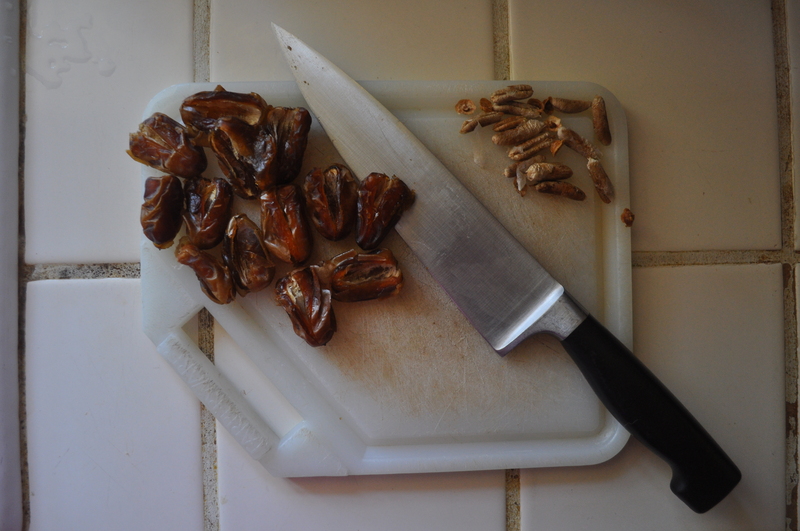 Carefully run a knife around the edge and let it cool at room temperature for at least another hour before placing in the refrigerator overnight. Try to resist the temptation to eat it until the next day. Tough, I know, but it’s much better this way, I promise. Okay so my main (and only) issue with cheesecake is the sheer amount of cream cheese involved. THREE 8 oz. packages. Can you imagine how many bagels you can coat with that?! Actually no. I take that back. I do not want to think about that. But excessive cream cheese amounts aside, cheesecake is the love of my life. I may have gotten a little teary-eyed when I was photographing it. And again when I ate a slice after dinner. Good GOD this cheesecake knows me. I put a lot of love into it! Essentially, it is my baby, and I am so proud of how it turned out. (Has my absurd relationship with food gotten weird enough for you yet???) Well. On that note, I recommend only making a cheesecake if you have lots of time on your hands and plenty of patience. But if that’s the case, make this one! 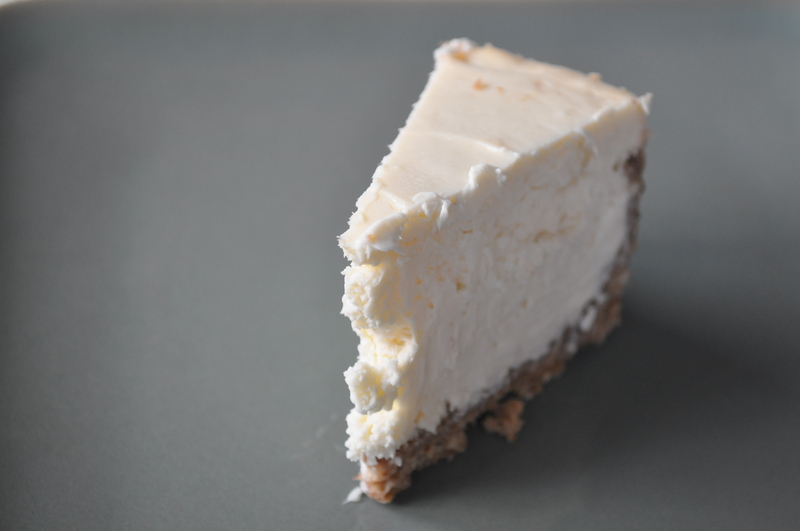 It’s pretty much the perfect, creamy, lovely, ideal cheesecake consistency (in my humble opinion). Not to mention the crust is fabulous. Categories: Dessert | Tags: cashew, cheesecake, coconut, dessert, gluten free, lime | Permalink. The gluten free baking adventure continues (semi-unfortunately, but c’est la vie, en fait)! Whatever. It’s making me creative I guess. So I have a confession to make. There was something strange about these cookies. They tasted awesome, but there was something a little funky about the texture. I based these off of this recipe buuut they turned out rather different than expected. Maybe it was the natural almond butter, maybe it was the sugar substitute (coconut sugar instead of brown sugar). Who knows! But anyways, they were soft and spongey rather than chewy or crumbly (as I feel cookies should be) and it was throwing me off. The more I thought about it, the more I realized: these should probably be muffins. I would even venture to say that they are destined to be muffins–they were essentially muffins masquerading as cookies. The batter was just soft and runny enough that they would have been perfect; plus, they’re not too sweet to thrive in muffin form. In other words, these cookies could have easily been eaten for breakfast. The fact that they were cookies, however, made that feel wrong. That being said, I did eat a few of these for breakfast anyways. But I will admit that it felt scandalous. So, friends, if you make these, I suggest you forget the cookie sheets and put them straight into your muffin tins. The baking time would probably be a little different, so you’re going to have to experiment and let me know what happens. Or just make them as cookies if that doesn’t bother you, that works too, of course. Preheat the oven to 350°. 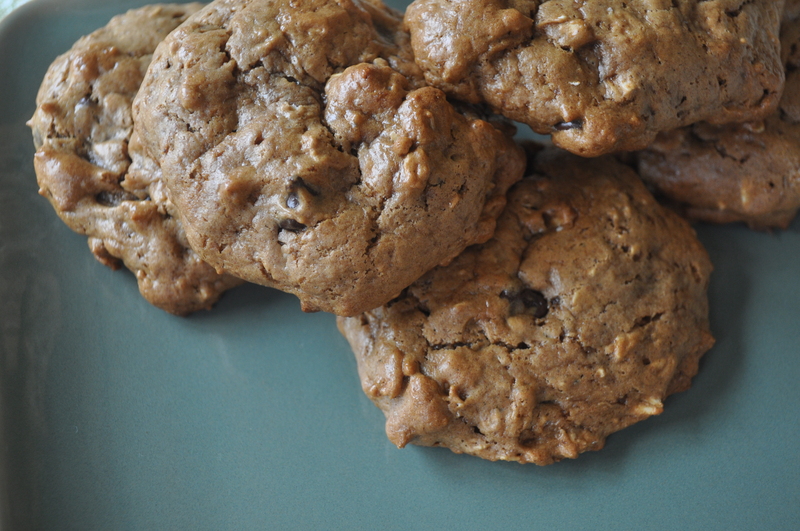 Throw your oats and baking soda into a little bowl and set these aside for a bit. Next, beat your almond butter, coconut sugar, eggs and vanilla together with an electric mixer until combined, then gently stir in the oats and baking soda. Fold in the chocolate chips last. 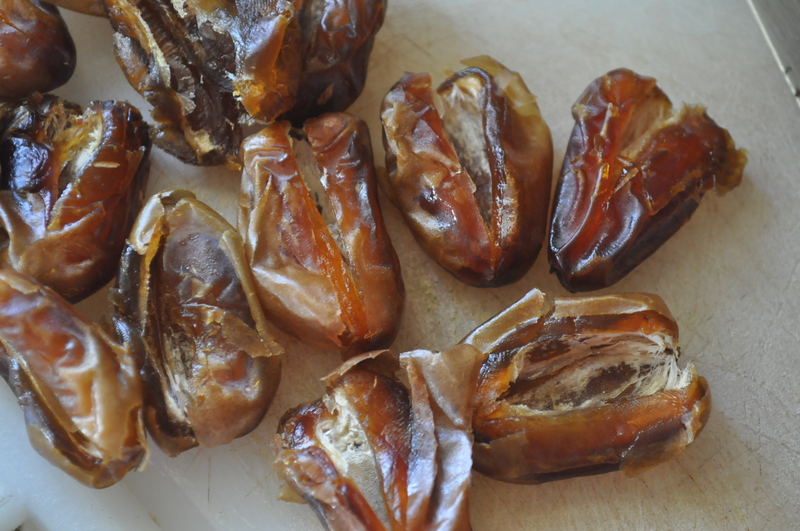 Place them 2″ or so apart on a greased cookie sheet (or like I said, make these into muffins!) and bake for about 10 minutes until the edges are just barely brown. They’ll look a little undercooked, but they’ll hold together once cooled. Obviously it goes without saying that you can make these with peanut butter. I’m just rather partial to almond butter. Or if you really want, you can substitute the chocolate chip for some other mix-in (although I find this a little sacrilegious, personally, but that’s just because I’m probably a certifiable chocolate addict). Keep being wonderful. You guys are great. Categories: Dessert | Tags: almond butter, chocolate chip, cookies, dessert, gluten free, oatmeal | Permalink. DISCLAIMER: this post is sassier and more sarcastic than usual. Don’t know. Bear with me. This was an experiment gone awry wonderfully well! Since when does that happen ever?! I’ve been experiencing some odd health things lately (meh) but my doctor recommended I try to eat gluten free for a little while just to see if I respond well to that. Maybe I have some weird kind of food sensitivity, who knows. I blame my Paris bread-binge. Anyways, the point is, even as a temporary experimental trial-run kinda thing, being gluten free is HAAARD. I don’t even eat bread that much, but suddenly when I’m not allowed to have it, it’s all I want/think about/crave/yearn for. Okay maybe that’s a little extreme (or is it???) but honestly, for all you gluten-eaters, think about how many things have flour in them. Now, think about not being able to eat them. Tortillas. Cake. Sandwiches. Pizza. Mkay I have to stop before I start crying. But YEAH. Rough. Anyways, this means I’ve been getting creative with my baking. Just because all these things I’ve been making are gluten free, doesn’t mean they’re not just as delicious–perhaps even more delicious, I might venture to say (gasp! )–than their gluteny counterparts. These are pretty wonderful, guys. And like my brownies, they’re made with pretty snazzy ingredients. But don’t fret, friends, they do not taste “healthy” in the slightest. Truuust me. Preheat the oven to 350°, grease an 8×8″ pan with your oil of choice (coconut oil hollaaaa), and set aside. Sift together the almond flour, baking soda, coconut sugar, and salt into a bowl. In a separate bowl, mix together the wet ingredients (eggs, coconut oil, and vanilla) and stir the two mixtures together. Gently fold in the dates, pecans, and chocolate chips and evenly spread into the pan. Bake for about 20 minutes until edges are lightly brown and toothpick inserted into the center comes out clean. Let cool. Dig in. 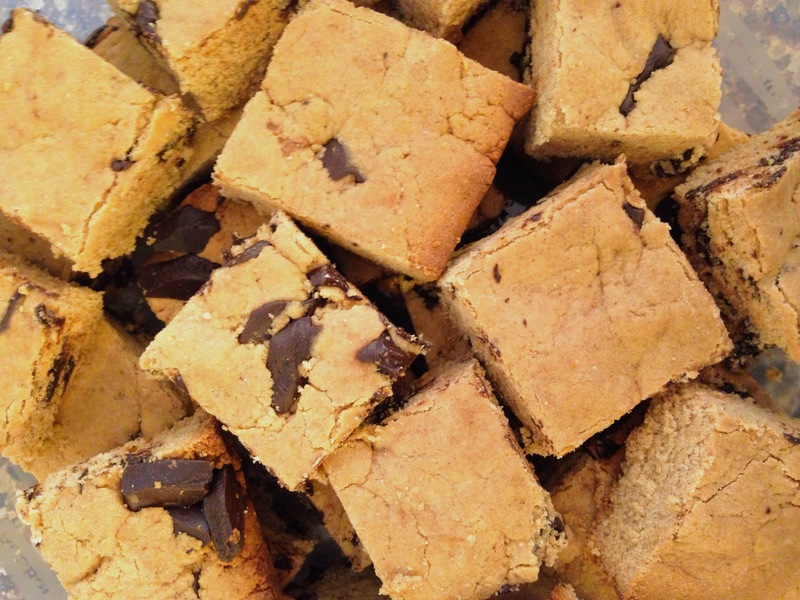 Categories: Dessert | Tags: blondies, chocolate chip, date, dessert, gluten free, pecan | Permalink.